Rachel O’Mahony, Centre for Infectious Diseases and International Health, Royal Free and University College London Medical School, Windeyer Building, 46 Cleveland Street, London, W1P 6DB, United Kingdom. Correspondence to: Rachel O’Mahony, Centre for Infectious Diseases and International Health, Royal Free and University College London Medical School, Windeyer Building, 46 Cleveland Street, London, W1P 6DB, United Kingdom. AIM: To investigate the bactericidal and anti-adhesive properties of 25 plants against Helicobacter pylori (H pylori). METHODS: Twenty-five plants were boiled in water to produce aqueous extracts that simulate the effect of cooking. The bactericidal activity of the extracts was assessed by a standard kill-curve with seven strains of H pylori. The anti-adhesive property was assessed by the inhibition of binding of four strains of FITC-labeled H pylori to stomach sections. RESULTS: Of all the plants tested, eight plants, including Bengal quince, nightshade, garlic, dill, black pepper, coriander, fenugreek and black tea, were found to have no bactericidal effect on any of the isolates. Columbo weed, long pepper, parsley, tarragon, nutmeg, yellow-berried nightshade, threadstem carpetweed, sage and cinnamon had bactericidal activities against H pylori, but total inhibition of growth was not achieved in this study. Among the plants that killed H pylori, turmeric was the most efficient, followed by cumin, ginger, chilli, borage, black caraway, oregano and liquorice. Moreover, extracts of turmeric, borage and parsley were able to inhibit the adhesion of H pylori strains to the stomach sections. CONCLUSION: Several plants that were tested in our study had bactericidal and/or anti-adhesive effects on H pylori. Ingestion of the plants with anti-adhesive properties could therefore provide a potent alternative therapy for H pylori infection, which overcomes the problem of resistance associated with current antibiotic treatment. Over half the human population is colonized by Helicobacter pylori (H pylori), a Gram-negative, microaerophilic bacterium. If untreated, infection is usually life-long and leads to chronic active disease. Although most infected people are asymptomatic, 5-10% of those infected with this bacterium develop severe gastroduodenal diseases, including gastric and duodenal ulcers, gastric lymphomas, and gastric adenocarcinomas. The current and most effective treatment for peptic ulcer disease is a triple therapy regimen consisting of a proton pump inhibitor, such as omeprazole, and two antibiotics, clarithromycin and either amoxicillin or metronidazole. However, there is an increase that disturbs due to the prevalence of antibiotic resistance, which is high in some areas of the world. Metronidazole resistance is more common than clarithromycin, the latter particularly having an adverse effect on the eradication rate. Second line therapies following failure of one of the initial regimes include triple and quadruple regimens containing antibiotics, such as levofloxacin or furazolidone, or even regimens containing five agents. Although the use of molecular methods can rapidly detect antibiotic resistance and host polymorphisms, which may lead to reduced efficacy of treatment and thus eradication failure[3,4], this is not a long-term solution to the rising trend of antibiotic resistance. Resistance to antibiotics is not limited to H pylori and has been an increasing problem for many years. There is therefore a constant need for new antimicrobial agents and novel approaches to treatment, ideally preventing disease, such as inhibition of adhesion or vaccination. Plants are known to be the source of phytochemicals which are beneficial for health and could also prevent diseases. Among these phytochemicals, two are of particular interest in the case of infectious diseases: antimicrobial and anti-adhesive agents. Numerous studies have been undertaken in order to find antimicrobial agents from plants against organisms ranging from viruses to protozoa. The major concern is the validation in human beings with well-designed clinical trials, and this has also been true for H pylori infection. Several in vitro studies have looked at the effect of plant extracts on H pylori. Anti-microbial effects have been reported for garlic[8,9], green tea, honey, thyme, some Iranian plants and the essential oils from several species of mint. Some of these studies have been validated in animals and confirmed the potential benefit of using plants as the source of anti-microbial agents against H pylori. Although garlic and cinnamon have been tested in human clinical trials with no significant effect, a recent study has shown that consumption of broccoli sprouts is associated with the eradication of H pylori in some patients, but more work needs to be done in determining the active ingredients of broccoli as well as performing studies on a larger number of patients. The search for anti-adhesive agents represents the second alternative to antibiotic therapy, which has received less interest, although studies in animals and human beings have proved its potential as a new therapy. Successful inhibition of adhesion has been shown in vitro with cranberry juice against H pylori and for the seaweed Cladosiphon fucoidan. Recently, Shibata et al. have demonstrated that Cladosiphon fucoidan inhibits adhesion of H pylori to porcine gastric mucin. By adding the plant to the drinking water of infected Mongolian gerbils, the prevalence of animals with infection was shown to be markedly reduced. Lengsfeld et al. have shown that adhesion of H pylori to human stomach sections was almost completely inhibited by pre-incubating H pylori with a fresh juice preparation of the fruit of the okra plant [Abelmoschus esculentus (L.) Moench]. Lengsfeld et al. have also demonstrated that acidic high molecular weight galactans from blackcurrant seeds could inhibit adhesion of H pylori to human gastric mucosa tissue sections. Moreover, Lee et al. have demonstrated the inhibition of H pylori adhesion by polysaccharide fractions of Panax ginseng and Artemisia capillaris to a human gastric adenocarcinoma epithelial cell line. As mentioned earlier, many plants have been shown to kill microorganisms but rarely have been studied for their anti-adhesive properties. We have therefore investigated both the bactericidal and anti-adhesive properties of 25 plants against H pylori. Sixteen of them have never been tested before against H pylori and are plants that are frequently used in cooking as well as in medicine in Sri Lanka, Iran, and the Middle East. Moreover, we have used an in situ adhesion assay, with stomach tissues expressing either the Lewis a (Le a) or Lewis b (Le b) antigen, in order to determine whether the plant extracts inhibit adhesion by blocking the major H pylori adhesin BabA (which binds to Le b) or have an effect on other adhesins. H pylori NCTC 11637 and six fresh clinical strains from Italian patients with peptic ulcer disease [obtained by one of the authors (DV)] were used in the study. All strains were stored on beads at -80 °C until use. Bacteria were grown for 2 d on Columbia agar plates supplemented with 5% horse blood (Oxoid, UK) at 37 °C under microaerobic conditions. The number of bacterial cells was determined by obtaining viable counts of serial dilutions and measurement of the optical absorbance at 600 nm (Ultrospec II, LKB, UK) of a suspension of bacterial cells to prepare a standard curve for H pylori. All studies thereafter used the same concentration of organism based upon its absorbance. Suspensions of 1×109 cells/mL were prepared from 1 mL carbonate buffer (0.15 mol/L NaCl/0.1 mol/L Na2CO3, pH 9.0). Five microliters of a 10 mg/mL fluorescein isothiocyanate (FITC, Isomer I, Sigma, UK) solution in dimethyl sulfoxide (DMSO, Sigma, UK) was added to each bacterial suspension and then incubated for 1 h with continuous shaking. The suspensions were then washed three times with phosphate buffered saline (PBS, 8.0 g/L NaCl; 1.21 g/L K2HPO4; 0.34 g/L KH2PO4, pH 7.4) containing 0.5 g/L Tween 20 (PBST; Sigma, UK), and resuspended in PBS. Labeling was confirmed by using flow cytometry (FACSCalibur, Becton Dickinson, UK). All incubation and washing steps were carried out in the dark at room temperature. Twenty-five plants were obtained from different sources and are described in Table 1. Extracts from the plants were prepared as follows: for turmeric, ginger, fenugreek, cumin, fennel, coriander, and chilli, plants were boiled to 100 °C in sterile distilled water (100 mg/mL), filtered through sterile gauze, neutralized to pH 7.0 and then sterilized. Extracts from all the other plants were prepared as follows: plants were boiled in sterile distilled water (100 mg/mL) for 10 min, allowed to cool and filtered through sterile filter paper (Grade 1, Whatman, UK). Fresh garlic, black peppercorns and cinnamon sticks were finely chopped before being boiled. All extracts were stored in the dark at -20 °C until use. Before the experiments of adhesion, plant extracts were filtered again (Grade 1 filter paper, Whatman, UK). Table 1 Plants used in the study. These plants were bought as both fresh and dried material. H pylori-negative biopsies of human stomach were obtained by one of the authors (DV), with the consent of the Ethics Committee, St Orsola Hospital, Bologna. Two sets of formalin-fixed stomach biopsies were used: those whose epithelial cells expressed the Lewis a blood group antigen (Le a stomach) and those expressing the Lewis b blood group antigen (Le b stomach). Five-micrometer thick sections of the stomach were cut using a Leica SM2400 rocking microtome. Sections were collected on polished glass slides coated with Vectabond (Vector Laboratories, UK). An antigen retrieval step was used by boiling for 5 min in an 800-W microwave in plastic Coplin jars containing 15 mL of citrate buffer (pH 6.0, 100 mol/L sodium citrate tribasic dihydrate, Sigma, UK). The Lewis phenotype of the tissue was determined by standard immunohistochemical staining using the DAKO EnVision Plus HRP kit (DAKO, UK) with anti-Le a and anti-Le b antibodies generously donated by Dr. J Bara, Hôpital St-Antoine, Paris, France. Both antibodies were supplied at a concentration between 1 and 5 µg/mL and diluted 1:10 for the anti-Le a antibodies and 1:50 for the anti-Le b antibodies. Bactericidal activity of the plant extracts was determined by a viable colony count. One hundred microliters of a suspension of 108 bacteria/mL was added to 900 µL of plant extract for 60 min. The control consisted of H pylori incubated with sterile distilled water. Serial 10-fold dilutions were made, and 100 µL of each dilution was plated onto 50 g/L horse blood agar (Oxoid, UK). These were incubated in gas jars under microaerophilic conditions using CampyPak (Oxoid, UK) for 3 d, and colonies were counted (colony forming units per milliliter, CFU/mL). Plant extracts that killed 100% of H pylori cells at 60 min (i.e. no colonies grew) were further tested at 0-, 15-, 30-, and 60-min intervals. All experiments were performed three times. The effectiveness of the plants at killing H pylori was expressed as percentage inhibition of colony growth (i.e. percentage of bacteria killed) compared to the control. In order to validate the inhibition of adhesion by the plant extracts, any lytic effect of the extracts on the bacterial cells was first examined. FITC-labelled and non-labelled bacteria (1×108 cells/mL) were centrifuged (9 000 g for 3 min), re-suspended in 500 µL of undiluted plant extract (100 mg/mL) and incubated with continuous shaking for 1 h at room temperature in the dark. After incubation, bacteria were centrifuged, washed in PBST and re-suspended in 500 µL sterile distilled water. One drop of the bacterial suspension was Gram stained. Using a Zeiss light microscope, the slides were observed for bacterial lysis. All the plant extracts were examined, except long pepper and threadstem carpetweed, which were not tested due to their limited supply. The negative control consisted of H pylori incubated with sterile distilled water and the positive control of H pylori incubated with Puregene PCR cell lysis solution (Flowgen, UK). The lysis experiments were performed twice. Tissue sections were incubated for 30 min in a humidified atmosphere with 200 µL of blocking buffer (PBST+20 g/L BSA) per slide. Next, the sections were washed three times, by placing in a slide rack in a glass trough containing 350 mL of PBST, on a rotator for 10 min. Suspensions of FITC-H pylori were centrifuged and re-suspended in plant extract to give 1×108 bacteria/mL. This was incubated with continuous shaking for 2 h, and then washed with the blocking buffer. For the controls, bacteria were re-suspended in sterile distilled water. The bacterial suspension (200 µL) was then added to each of the stomach sections and incubated in a humidified atmosphere for 1 h. After incubation, slides were washed in PBST as previously, and 200 µL of propidium iodide (PI, 5 µg/mL, Sigma, UK) was added and each slide was incubated for 3 min. Slides were then washed twice in PBST, air-dried and mounted with Vectashield (V-1000, Vector Laboratories, UK). All incubation and washing steps were carried out in the dark at room temperature. Two tissue sections were used for each plant that was tested. 50 mg/mL (diluted in sterile distilled water) and incubated with H pylori strain 11 637 and Le b stomach sections. For those plants which had an anti-adhesive effect, the inhibition assay was repeated using Le a and Le b stomach sections, and the plants were diluted to concentrations of 5, 10, and 50 mg/mL. Because 50 mg/mL was found to give a good inhibition of adhesion, for all further inhibition experiments, all plants were used at this concentration. Inhibition of adhesion experiments were then performed on three clinical strains. All experiments were performed three times. Sections were observed using a Laser Scanning Confocal Microscope (Zeiss: Axiovert 100 TV) with a ×20 Zeiss LD-ACHR objective. The excitation wavelengths were 488 nm (for FITC) and 568 nm (for PI). We used 522- and 605-nm band-pass filters to acquire FITC emission and PI emission, respectively. Digital images (512×512 pixels) of the sections were captured using a Biorad Lasersharp 2000 Confocal Laser Scanning System. Images were converted to TIF files for processing. Two photographs showing adjacent areas of the tissue were taken for each tissue section. Using these digital images, the number of adherent H pylori were quantified as previously reported (Region of Interest method with standard area method of counting) using Metamorph Image analysis software (version 4.5r, Universal Imaging Corporation, USA). Using the Mann-Whitney (non-parametric) test, the difference between the number of adherent cells for each plant was compared statistically to the controls (0 µg/mL plant extract). Among the 25 plants tested for their bactericidal activity against H pylori, eight showed no activity after 60 min of incubation, these were Bengal quince, nightshade, garlic, dill, black pepper, coriander, fenugreek and tea (data not shown). The other 17 plants had activity (results are summarized in Table 2). Turmeric was the most efficient in killing the seven strains within 15 min. Ginger, cumin, and chilli were able to kill all the strains within 30 min, whereas liquorice, oregano, black caraway, and borage killed the strains within 60 min. Cinnamon had a bactericidal activity against H pylori, although the seven bacterial strains differed in their sensitivity. Moreover, the bacterial colonies were very small, reflecting some resistance to cinnamon. Finally, the following plants showed a bactericidal activity against H pylori but without achieving a complete inhibition of growth (i.e., killing all the colonies) within 60 min: columbo weed, yellow-berried nightshade, long pepper, threadstem carpetweed, sage, tarragon, nutmeg, and parsley. Small colonies were seen with yellow-berried nightshade, threadstem carpetweed, and sage. Table 2 Bactericidal activity of plants against Helicobacter pylori, determined using viable colony count. ‘% inhibition of growth’ indicates the percentage of bacteria that were killed by the plants, (i.e. the colonies did not grow), compared to the control. None of the 23 plant extracts that were tested caused lysis of H pylori cells, as the organisms that remained were spiral and intact like the negative control. Bacterial cells incubated with Puregene PCR cell lysis solution were lysed and no intact spiral shaped bacteria could be observed (Figure 1). 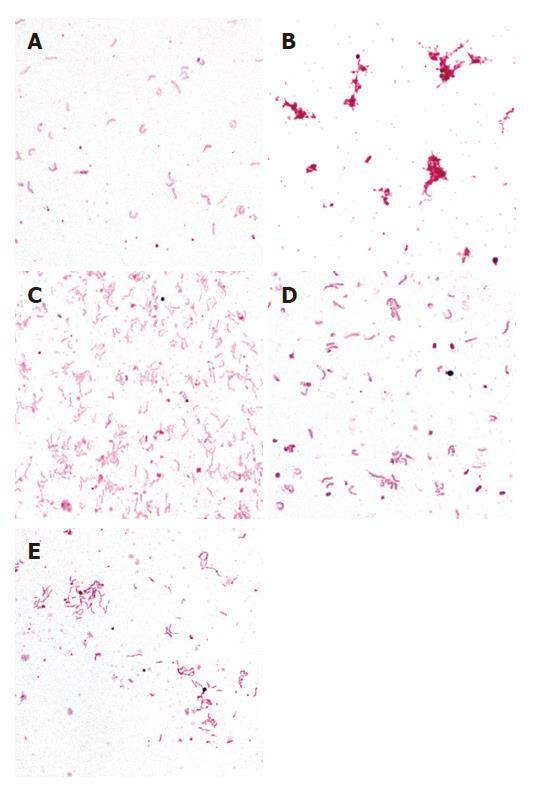 Figure 1 Bright-field images showing H pylori lysis experiment. A: negative control (H pylori + distilled water); B: positive control (H pylori + cell lysis solution); C: H pylori + 0.05 g/mL turmeric; D: H pylori + 0.05 g/mL borage; E: H pylorii + 0.05 g/mL parsley. Images taken using x100 objective. Of the 23 plants screened for anti-adhesive properties, turmeric, borage, and fresh parsley (50 mg/mL) were found to inhibit adhesion of H pylori 11637 to the stomach sections expressing the Le b antigen (Figure 2). Further testing of these three plant extracts using H pylori 11637 and three clinical isolates confirmed that they were able to inhibit H pylori adhesion to stomach sections expressing either the Le b antigen or the Le a antigen (Figure 3). Mean inhibition rates of the four strains to the stomach sections expressing the Le a antigen were 61.9%, 61.1%, and 33.9% for turmeric, borage and parsley, respectively. The differences between the number of adherent bacteria compared to the controls (0 µg/mL) were: highly significant (P<0.01) for turmeric; not quite significant (P = 0.07) for borage; and not significant (P>0.05) for parsley. For sections expressing the Le b antigen, inhibition rates were 62.3%, 59.5%, and 48.5% for turmeric, borage and parsley, respectively. The differences between the number of adherent bacteria compared to the control (0 µg/mL) were: not quite significant (P = 0.07) for turmeric; significant (P<0.05) for borage; and not significant (P>0.05) for parsley. 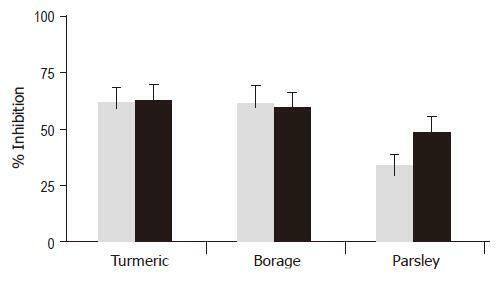 There was no significant difference between the number of adherent bacteria (to Le a or Le b stomach sections) when comparing each of the plant-treatments, except for adhesion of bacteria to Le a sections where there was a highly significant difference (P<0.001) between turmeric and parsley. 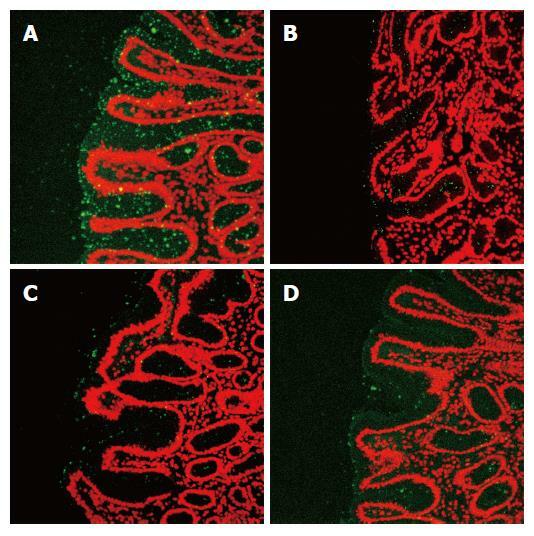 Figure 2 Confocal images showing inhibition of H pylori adhesion by A: distilled water (control); B: turmeric (0. 05 g/mL); C: borage (0.05 g/mL) and D: parsley (0.05 g/mL); to stomach sections expressing the Lewis b blood group antigen. Figure 3 Inhibition of H pylori adhesion by turmeric, borage and parsley to stomach sections expressing either the Lewis a or Lewis b blood group antigen. Experiments were performed three times using four strains of H pylori. Mean percentage of inhibition is shown for each plant. Gray bar, Lewis a stomach; Black bar, Lewis b stomach. Investigations into plant materials as alternative sources of antimicrobials have become more common over the past few years, due to the increased rate of development of antibiotic resistant organisms. New strategies to combat infection are also being sought and one such strategy is the use of ‘anti-adhesive’ molecules, targeting the primary step of infection - adhesion of the organism to host tissue. In this study, we therefore examined both the anti-microbial and anti-adhesive properties of 25 plant extracts against H pylori, obtained simply by boiling, as would occur during the normal cooking process. Of the eight plants that were not able to kill H pylori after 60 min of incubation (Bengal quince, nightshade, garlic, dill, black pepper, coriander, fenugreek, and black tea), two had been tested previously against H pylori. Several studies have shown that garlic does kill H pylori in vitro and in vivo[8,9]. It is probably due to the boiling method of extraction that this effect was not observed in this study, since boiling has been shown to reduce the inhibitory activity of garlic against H pylori[24,25]. Fenugreek sprouts have been shown to have high anti-microbial activity against H pylori. In the present study, fenugreek appeared inactive but the seeds were examined rather than sprouts, which may account for the difference in results. Green tea catechins have previously been reported to have antibacterial effect against H pylori, which was confirmed in Mongolian gerbils. Moreover, Chinese tea has been shown to reduce H pylori infection in patients. In this study, black tea was tested, but no bactericidal activity against H pylori was observed. Columbo weed, long pepper, parsley, tarragon, nutmeg, yellow-berried nightshade, threadstem carpetweed, sage, and cinnamon had bactericidal activity against H pylori, but total inhibition of growth was not achieved within 60 min. Moreover, a reduced colony size was observed with some of them, such as yellow-berried nightshade, threadstem carpetweed, sage, and cinnamon. Nutmeg, tarragon, and cinnamon have previously been reported to inhibit the growth of H pylori in vitro. When tested in clinical trials, however, cinnamon was found to be ineffective at eradicating H pylori. Among the plants that killed H pylori, turmeric was the most efficient, followed by cumin, ginger, and chilli. These results confirmed what has been published before regarding turmeric, chilli, and ginger, but cumin has not been previously tested. Other plants, such as borage, black caraway, and oregano, which have never been tested before against H pylori, were also found to have bactericidal effects. Finally, the previous reported bactericidal effect of liquorice has been confirmed[36,37]. As well as looking at their bactericidal activity, all these plants were also tested for their anti-adhesive effects, using an in situ adhesion assay. Stomach tissues expressing either the Le a or Le b antigen were used. This was in order to determine whether the plant extracts inhibit adhesion by blocking the major H pylori adhesin BabA, which binds to Le b, or have an effect on other adhesins. Most studies have not attempted to determine which adhesin is being blocked, and this may be important because combinations of plants targeting several different adhesins may provide a more potent therapeutic treatment. Extracts of turmeric, borage, and parsley were able to inhibit the adhesion of H pylori strains to both Le a and Le b stomach sections. Turmeric was the most effective at inhibiting H pylori adhesion to both Le a and Le b stomach sections, followed by borage and fresh parsley. From these results, it seems that both turmeric and borage could inhibit adhesins other than BabA, because the percentage of inhibition was almost exactly the same for Le a and Le b stomach sections. Parsley possibly inhibited BabA as well as other adhesins, because inhibition occurred on Le a and Le b stomach sections, but was higher for Le b stomach sections, indicating that it had a greater effect at inhibiting BabA. The morphological studies demonstrated that the reduction in adhesion caused by these plant extracts was due to the true inhibition of adhesion, but not because the plants caused the bacteria to lyse. Tarragon is the only plant in this study that has been tested previously for its anti-adhesive effects, where it was found to inhibit H pylori adhesion to human gastric adenocarcinoma cells. However, in the present study, tarragon failed to inhibit H pylori adhesion to human stomach sections. This discrepancy is probably due to the differences between using cell-lines and whole-tissue. Plants contain multiple organic components including phenols, quinones, flavones, tannins, terpenoids, and alkaloids all of which are known to have bactericidal effects. These substances are also water-soluble and therefore very likely to be present in the plant extracts produced in this study, and are likely candidates responsible for the killing effect of the extracts on H pylori. Plants also contain many water-soluble proteins, lectins and carbohydrates which may bind specifically to sugar residues, polysaccharides, glycoproteins or glycolipids, such as the adhesins present on the cell surface of H pylori. In the event of such interactions occurring, the result would be to block the availability of the adhesin to its receptor and hence prevent adhesion of the bacterium to the stomach sections. Despite the success of many plant materials at killing organisms, resistance can develop to these too, as shown in this study. The present work is of importance because plant extracts were shown to inhibit adhesion of H pylori to the stomach - an alternative strategy to bactericidal compounds. Because inhibition of adhesion works on the principle of sterically blocking bacteria from attaching to host tissue, the likelihood of resistance developing in organisms, which occurs when the organism is killed, is less likely. Although the majority of individuals colonized by H pylori are asymptomatic, a proportion of patients develop peptic ulcers (duodenal and gastric), and an even smaller proportion develop gastric cancer. Globally, H pylori is the major cause of gastric cancer and has been classified as a Class I carcinogen by the WHO. Some plants are known to have anti-ulcerogenic and anti-cancer effects. Most of the plants tested here, which have bactericidal and/or anti-adhesive properties, also have anti-ulcerogenic or anti-cancer effects, for example, turmeric[38,39], ginger[40,41], cumin[42,43], borage, liquorice, and parsley. Chilli has recently been shown to have detrimental effects on the gastric mucosa. The anti-cancer and anti-ulcerogenic effects of ginger, cumin, liquorice, parsley, turmeric, and borage combined with their bactericidal and anti-adhesive properties, as shown in this study, suggests that ingestion of these six plants could have important therapeutic implications for patients with H pylori-induced peptic ulcer disease or gastric cancer. As turmeric killed 100% of organisms within 15 min, it could therefore be a useful anti-Helicobacter agent in vivo, because, if given orally, it would be able to kill H pylori despite the short amount of time that it would remain in the stomach during digestion. Moreover, these plants could be used in combination with antibiotics, possibly increasing the success of eradication, as has been shown in vitro for cranberry juice. Most studies have used plant extracts that are obtained by chemical processing, for example, ethanol extracts. In developing countries where antibiotics are less freely available, such processing methods of plants would be impractical and/or expensive. This present study is therefore of importance because it has demonstrated that several plant extracts are effective against H pylori and are obtained simply by boiling the plants. Such a method may provide a treatment that is simple, relatively inexpensive and could be incorporated into the normal diet of the patient, which is highly favorable. Herbal treatments are usually unregulated and the safety of plants consumed is often unknown. The plants used and shown to be effective in this study are already commonly consumed, and thus they are already known to be safe. Although the cidal and anti-adhesive effects of ginger, cumin, liquorice, parsley, turmeric, and borage have been shown in vitro, further studies are needed to be carried out to investigate their effects in vivo, to see whether the extracts are able to remain effective despite the harsh process of digestion. We are grateful to Martin Avedian for the idea of testing borage and for its supply and Ms A. Al-Dossary (School of Hygiene and Tropical Medicine, UK) for providing black caraway.